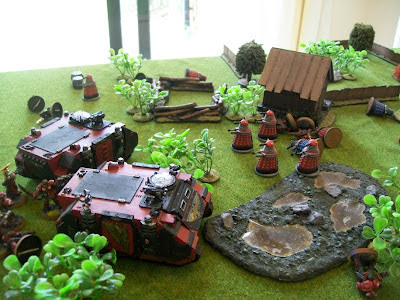 A couple of years ago, I wandered into my local Waterstones bookseller, looking for a novel involving space battles. While battles between spaceships has long been one of my favourite topics, for some reason the idea was burning particularly hot that day. After a good thirty minutes of searching, I ended up buying two books. One of those I have completely forgotten, the other was The Lost Fleet: Dauntless by Jack Campbell. I devoured that book, bought the next book in the series, and devoured that too. I can’t remember another time in my adult life when I’ve picked up a book and enjoyed it so thoroughly. By the time I had finished the six book series, I was happy to call it my all-time favourite space adventure. Its combination of themes drawn from the Cold War, the King Arthur myth, the highway vs. interstate development, and good old fashioned honor and humanity, connected with me in a very personal way. Now The Lost Fleet won’t be to everyone’s taste. The hero wears a gleaming white hat, and none of the characters are heavily developed. But Jack Campbell is very good at coming up with interesting situations, both tactical military situations, and internal interpersonal situations that challenge the fleet from within. He has also found a way of writing space battle involving huge fleets of ships that is easy to follow, but keeps you on the edge of your seat. All of this is a very long-winded introduction to my purchase of the latest book in the series: The Lost Fleet – Beyond the Frontier: Invicible. This is either the eighth book in the series, or the second book in the Beyond the Frontier series, depending on how you want to look at it. Either way, it is a fine read. I must admit, that the last book in the series was just a bit of a letdown for me. Campbell obviously had a lot of ideas to present to get the second series started, and I found the whole thing a bit slow. However, with the fleet off and moving through space again, the series has regained its usual high pace. This new book is classic Lost Fleet, with lots of new threats, lots of battles, a bit of murky politics, and enough ‘YES’ moments to more than satisfy. 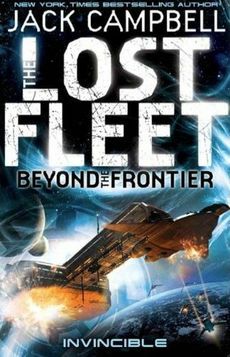 So, if you like your space adventures with lots of action and a good guy who actually deserves the term, I wholeheartedly suggest The Lost Fleet. I don’t remember when I first heard Treasure Island. I assume my father read it to me when I was quite young. However it came about, the story has stuck with me my entire life. I still think it is probably the greatest adventure story ever written, and Robert Louis Stevenson has remained my favourite and most influential author. So, when I heard that my wife, a primary school teacher, was presenting the book to her class, I was naturally enthusiastic. But. After reading the book for the first time, she decided the book was too difficult for her nine year olds. Too difficult? I couldn’t have been more than nine when I first heard it. But then, I had the story presented one-to-one. Every time I didn’t understand a word, I could just ask. It’s different when you have 30 children. And the book does contain a lot of language that is either archaic or obscure to kids of today. So, my wife settled on a happy medium. She got a modern abridgement of the book which she read to her children, but for various sections she would switch over to the original Stevenson for his wonderful descriptions. 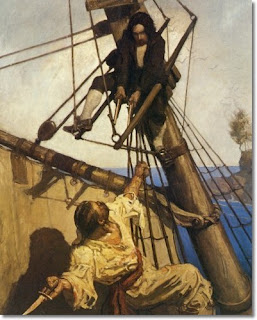 Thus the kids got the action-packed plot, told in a way they could understand, along with the fabulous descriptions of Black Dog, Billy Bones, and Long John Silver. Even these little sections contained plenty of new vocabulary for the kids. So are kids still drawn to the story? Well, according to my wife, her kids now constantly and somewhat randomly say to one-another: ‘One more step Mr. Hands and I’ll blow your brains out. Dead men don’t bite, you know.’ It’s one of the great moments in the story. If you don’t know what I’m talking about, run out and buy the book today! 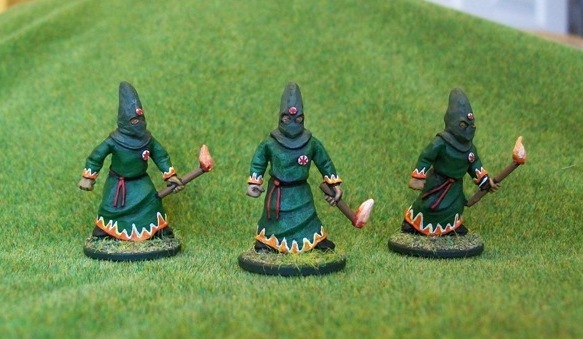 Miniature Friday - Generic Cultists! Got some heroes looking to fight evil, but don't have anyone for them to fight against? Look no further than 'Generic Cultists'. That's right, these guys in green can be your bad guys from the middle-ages straight through to the future. Some things just never go out of style. I picked these guys up at Historicon last year from Sgt. Major Miniatures, and only recently got around to painting them. I went with a pretty simple paint scheme, a couple layers of green, and then I added some flames around the cuffs and hem. 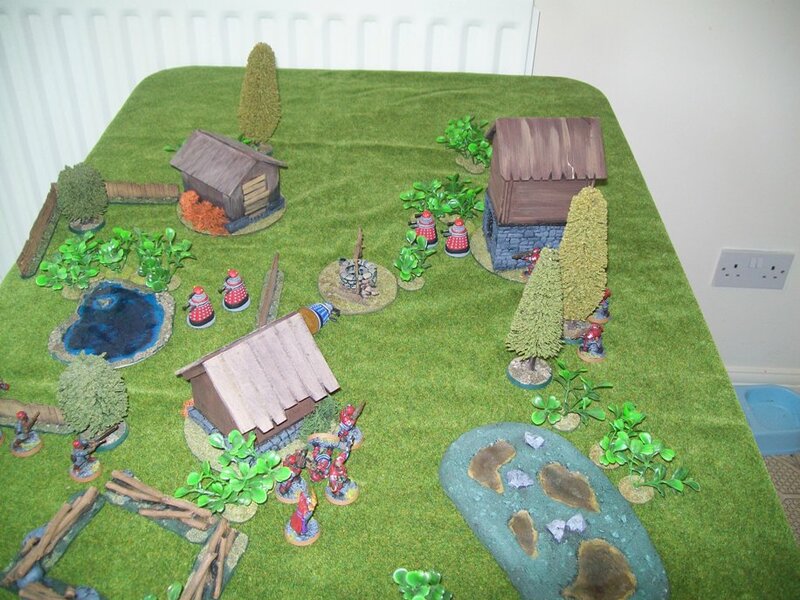 It's a lot easier than you might think and really makes the figures stand out on the table. How useful is a word than can mean both one thing and the exact opposite of that thing? Such a word is the verb ‘cleave’. You can quite correctly ‘cleave together’ and ‘cleave apart’. Cleave can mean either to split or sever something into pieces or it can mean to stick together or adhere to. Just to make matters even more confusing, it can also mean to be faithful to. So, when someone suggests you ‘cleave unto your wife’, make sure you get clarification on what exactly they are suggesting. Oh, ‘cleave’ is also a noun, meaning a flat surface formed through ‘cleavage’, that is the act of splitting something, not sticking things together, or being faithful to them. I think. Chronon energy is one of the rarest and least understood forms of energy known to science. While it is sometimes found in nature, no human technology has ever been known to produce it. 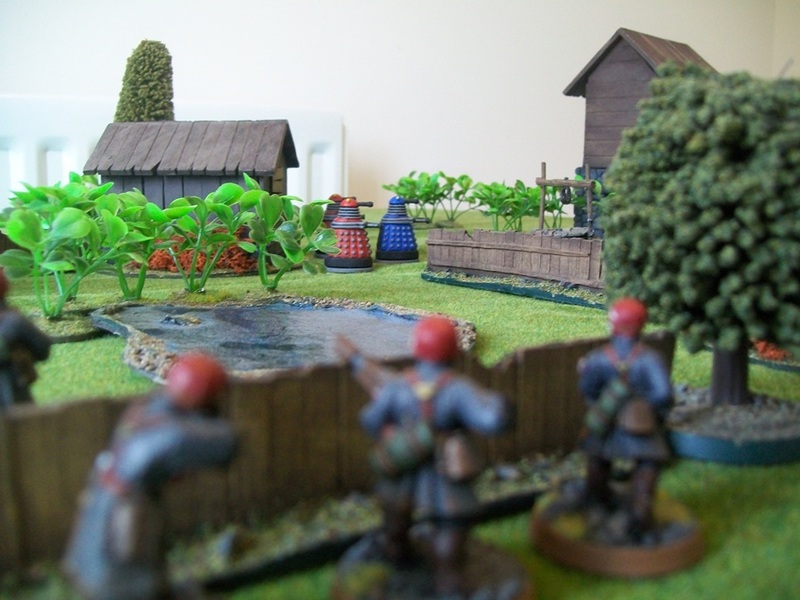 Thus, when the science team aboard the Black Moab detected chronon emissions from an abandoned village, deep in the marshes, they quickly requested a patrol be despatched. 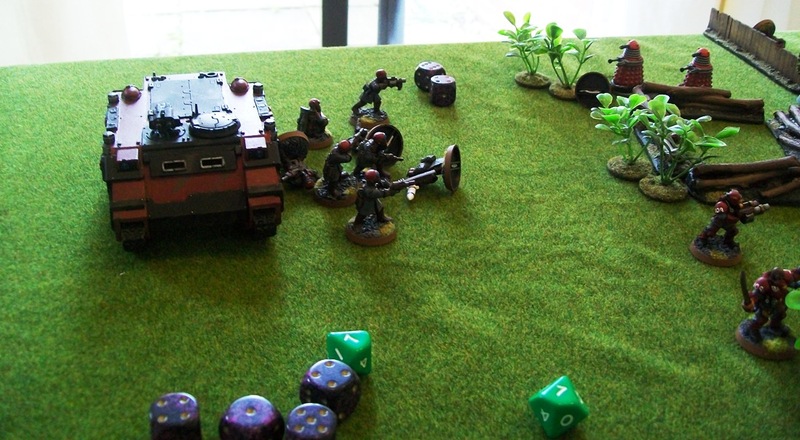 The patrol consisted of two squads mounted in Rhino APCs. Squad one, led by Sgt. 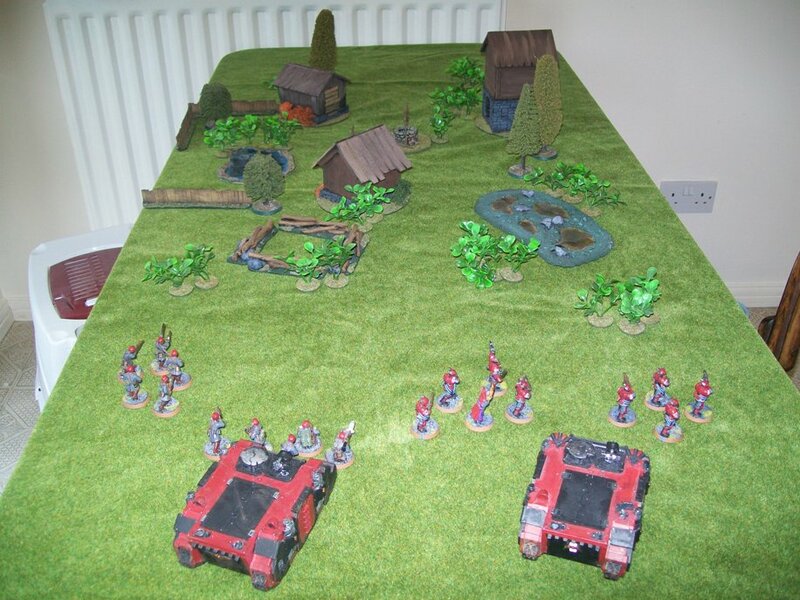 Corvex, contained 8 members of the elite 109th ‘Demon Blade’ Inquisitorial Regiment and an attached Psyker. Squad two, under the command of Sgt. Kadarian, was made up of ten men from the 66th Tagovian High Guard. As the detachment approached the village, the muddy road gave out, and Sgt. Corvex decided to proceed into the village on foot. Not expecting trouble, but always alert, the two squads divided into four fire teams. 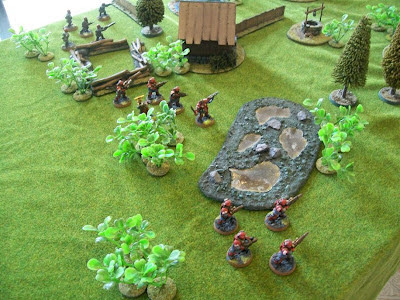 Three would advance into the village, while half of the High Guard remained to protect the vehicles and act as a reserve. The village was eerily quiet. There was no sign that anyone had visited the place for years. 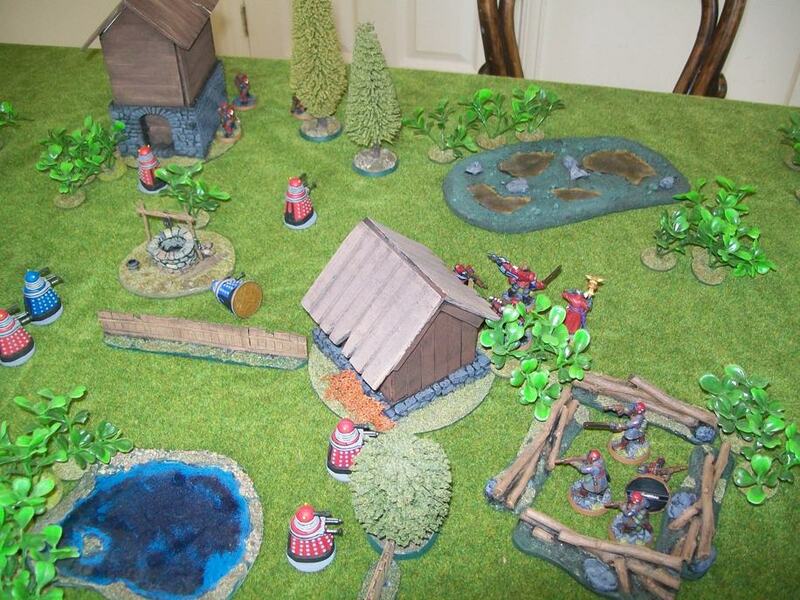 Then, on the left flank, in front of the High Guard, a figure emerged from one of the huts. Sgt. Kadarian ordered his men to hold fire, unsure if what he was seeing was a creature or some form of robot. The thing turned towards Kadarian, a light glowing from a single eye-stalk. It spoke one word in a grating, high-pitched voice. ‘Exterminate’. The creature fired a built in laser weapon, which caught one of Kadarian’s men in the chest and flung him backwards. Kadarian ordered his men to open fire, then watched in dismay as their lasfire bounced harmlessly off the creature’s tough armour. More creatures came into view. On the right flank, Sgt. Corvex also ordered his men to engage the enemy. In a manner of seconds, four men were down, killed or badly wounded, while only one of the armoured creatures had been destroyed, that by a direct hit from a meltagun. The Psyker, attempting to probe the mind of the creatures managed to confuse one and sent it trundling off in the wrong direction. With the laser fire shredding through the soft wood of the abandoned huts, Sgt. Corvex ordered everyone to fall back. More men died, their bodies flung backwards like rag dolls when struck by the powerful enemy weapons. 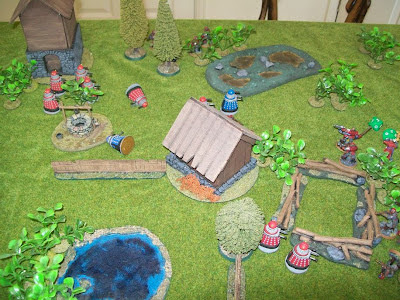 Another of the monsters exploded under the combined fire of Demon Blade hellguns, and a third detonated when struck by a shell from the High Guard rocket team. Unsure of enemy numbers, and seeing his men in danger of being overrun, Corvex ordered his Rhino forward. Its hull mounted gun added to the fire as it charged in to pick up the Demon Blade. Although the men managed to make it onboard, an enemy weapon struck the vehicle, blowing off its left tread. Thankfully, the surviving High Guard had made it back to their Rhino. 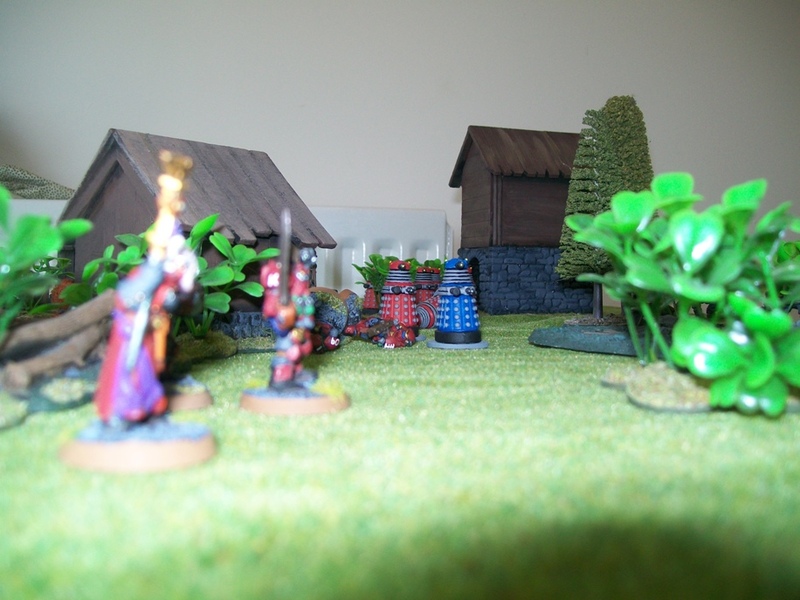 Their vehicle charged over behind its stricken counterpart, and the Demon Blade made a successful transfer under fire. 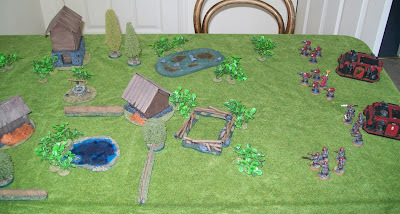 Enemy weapons continued to strike the fleeing Rhino as it sped off down the old marsh road. Losses among the Demon Hunters were heavy. 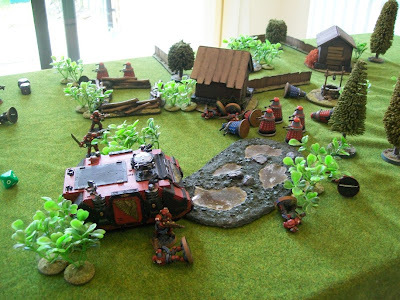 Five of the High Guard had been left for dead on the battlefield, along with four of the Demon Blade. Each squad also had one man badly wounded, who managed to survive. They also lost one of their Rhinos. From footage pieced together from helmet cameras, it is estimated that five of the alien creatures were destroyed in the fire fight. These days, I don’t paint many historical figures. I just get more enjoyment out of the hobby when it has a tinge of fantasy. That said, the two are not always mutually exclusive. I’ve currently got a little side-project going, which involves some historical warriors in a mythical encounter. 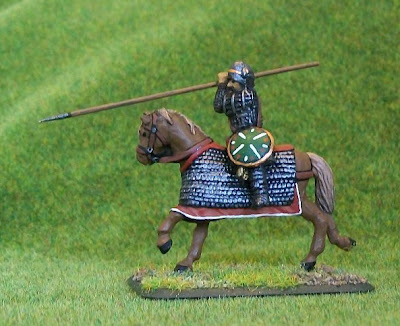 The heroes of this game are 1st Century Persians, or Parthians as they were known at the time. 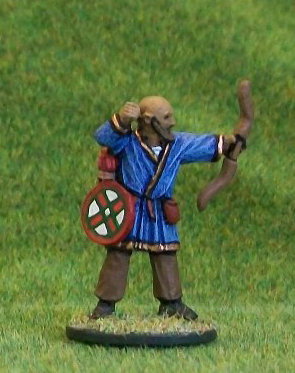 I’ve just finished painting up my first couple of warriors. 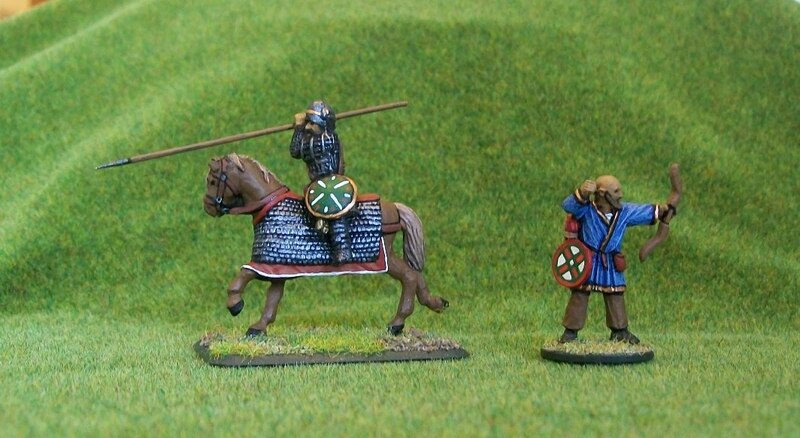 The figures are from Gripping Beast and are great bases for people who like to add some colourful details to their figures. I’m not the most skillful free-hand painter, but I really enjoyed adding a few little designs to the figures. I think these guys will really standout on the tabletop.